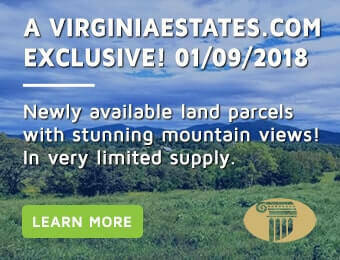 If you are interested in Rappahannock real estate, then consider Virginia Estates your official “Rappahannock Real Estate Guide.” Our central Virginia real estate agents have access to Rappahannock real estate MLS listings and have the state’s most complete array of services for the Rappahannock County. The northwestern boundary of Rappahannock County is in the Blue Ridge Mountains, which serve as a natural boundary that separates Rappahannock County from Page and Warren Counties. The Rappahannock River forms the northeastern boundary and separates Rappahannock County from Fauquier County. The County is bounded on the southeast by Culpeper County and on the southwest by Madison County. People in the northern section of Rappahannock County, including Flint Hill and Chester Gap, are more likely to conduct business and patronize the arts in Front Royal. People in the southern and western sections of Rappahannock County, including Sperryville and Woodville, often patronize the Culpeper community. People in the eastern section of Rappahannock County, including Amissville and Washington, tend to favor Warrenton businesses and goings-on. When English settlers first arrived in Virginia in 1607, the area now occupied by Rappahannock County was a wild, forested territory inhabited by Native Americans, the Manahoacs and Iroquois, who hunted and fished in the foothills of the Blue Ridge Mountains until an influx of settlers drove them west. By 1722 at the time of colonization, the majority of the early settlers in Rappahannock were not foreign born, but had moved down from northern regions of Virginia. Rappahannock’s new inhabitants were mainly of English descent from the Tidewater region. Other settlers included Scots-Irish from west of the Blue Ridge and Germans from the north and from the Germanna Ford area in modern Spotsylvania and Culpeper Counties. In addition, a minority of Welsh and French settlers also moved into Rappahannock. The French settlers arrived from Manakin, a Huguenot Colony located on the James River. In fact, Amissville, one of the villages in Rappahannock County, was named after the Amiss family from the Colony at Manakin. People from Rappahannock were active participants in the Revolutionary War and the War Between the States. Although during the Civil War many small skirmishes were scattered throughout the County, the closest major battle occurred in Front Royal, north of Flint Hill. Named after the river sourced from streams in the Blue Ridge Mountains, Rappahannock became separate from Culpeper County by an Act of the General Assembly in 1833. The five villages, Amissville, Chester Gap, Flint Hill, Sperryville, Woodville, and the Town of Washington have significant historical value. Washington is the County seat. Fondly called “the first Washington”, and somewhat less politely referred to as “little Washington” to distinguish it from its larger cousin, it was surveyed and plotted by George Washington in 1749 and was established as a town in 1796. The villages of Rappahannock were frontier posts or crossroads. Today, these small residential clusters represent a focal point for County residents providing retail services, meeting places, post offices, and church activities. As it was in the 1700’s, Rappahannock’s economy is still agriculturally based with the surrounding villages providing basic services for the farms. Shenandoah National Park has 32,000 acres in the county and provides ideal settings for fishing, hunting, horseback riding, hiking, camping and canoeing. The Appalachian Trail and Skyline Drive traverse the mountain crests and are easily accessible from the county. The town of Washington is well known for its Inn at Little Washington, which showcases a gourmet restaurant and first-class lodging. Horse lovers will find Rappahannock County an ideal environment for the horse industry: fox hunting, steeplechase racing, horse shows, and polo matches are popular events. If you are interested homes for sale in Rappahannock County, VA, contact Rick Walden and the team at Virginia Estates. Our realtors and agents list some of the most beautiful properties in the Commonwealth and are true experts in the region.